Netizens found this tiny, but adorable interaction between�Red Velvet's Seulgi and Wendy�super funny! 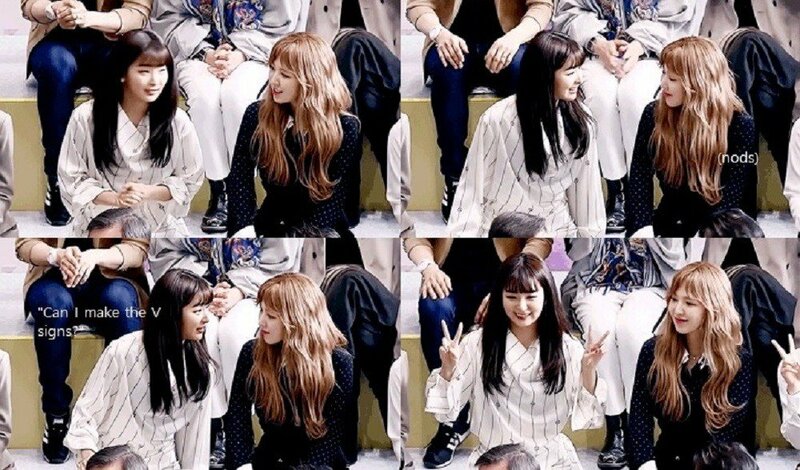 Recently, netizens found several GIFs of the two girl group members Seulgi and Wendy helping each other with the strangest thing. What kind of permission did Seulgi ask Wendy for? If she could make double peace (V) signs to the camera! In addition to this moment, Seulgi and Wendy are already well-known among their fans for being two 94-line best friends in the group. Even though they are the same age, fans found many interactions between them more like an older and a younger sibling! Not only does Wendy help Seulgi out often (such as the moment above with�Wendy helping out Seulgi tie her loose cuff strings), but Seulgi has instances of looking out for Wendy, too. Below, netizens found Seulgi organizing Wendy's bangs during a radio show, even when they were in the middle of laughing and talking! Do you ship Seulgi x Wendy?